Unlike Saturday, today I was able to plant some of my pots! Unlike Saturday, today was a beautiful, sunny 19 degree day!! I think I may have even got sunburned! I personally am a country girl at heart. I grew up spending summers on my friends' farms. One had cows that needed milking, another had pigs that needed feeding and cleaning out, but when the chores were done - they each had horses that needed riding. I had no problem helping with chores when that was the reward! 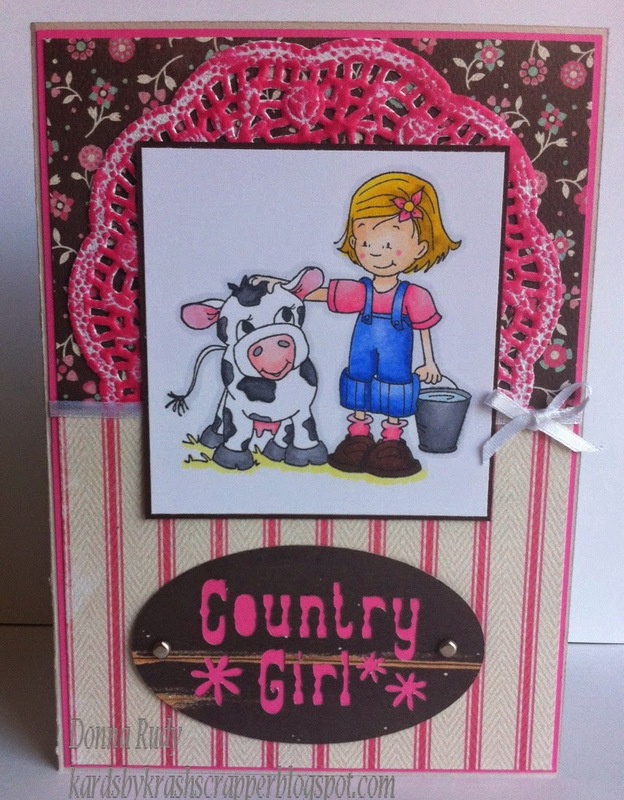 Today I am posting a card I completed to include in Kraftin Kimmie Stamps Challenge #230 - Girly Girl. To colour match the (paper) doily I dabbed it using ink that matched my colour scheme. The list of products used is below the card. Thanks for joining our challenge at Kraftin' Kimmie Stamps! Good luck! Gorgeous card! I love the coloring and this stamp! Good luck in the Kraftin' Kimmie Stamps challenge. Also! Kraftin' Kimmie Stamps is currently having a Guest Spot Contest...join in the fun!